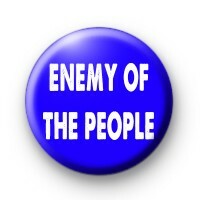 Blue and white Enemy of the People badge, this term was made famous by The Daily Mail on their front page attacking judges. A bit of fun for more liberal customers. Standard 25mm political badge.